Studies and Texts 187. 2014. xvi, 192 pp. This volume historicizes Augustine's habit of turning to ancient diction through the specific act of quotation, locating this habit in pedagogical and philosophical practices owed to his training. Far from disdaining or rejecting his ancient inheritance, Augustine made his first task at Cassiciacum the articulation of a method by which the pagan auctores represented by Virgil might be made safe for Christianity. 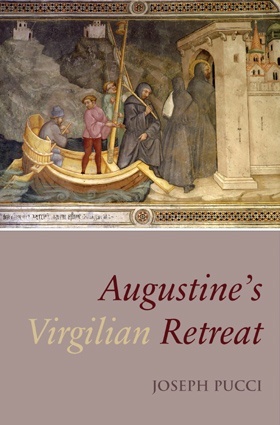 Augustine's Virgilian Retreat historicizes Augustine's habit of turning to ancient diction through the specific act of quotation, locating this habit in pedagogical and philosophical practices owed to his training. At Cassiciacum, where the goal was the development of a disciplina christiana, both pedagogy and philosophy support the articulation of a three-pronged method by which the paganauctores represented by Virgil might be made safe for Christianity. This method for quoting the auctores as a means of recuperating them for Christian truth is put forth in the Contra Academicos, and practiced in the De beata vita. In the De doctrina christiana, the specifically bipolar notion of language put forth in the Soliloquia is applied to scripture and more fully developed as a practice beholden to a charitable reader. But there is nothing to separate the reading of Virgil pursued at Cassiciacum from Augustine's charitable reading of scripture, and the more fully developed readerly model articulated in the De doctrina christiana makes possible a recuperative reading of the Confessiones, where quotations from the auctores have been seen to be ornandi causa. On the contrary, the work pursued at Cassiciacum makes it clear that, far from disdaining or rejecting his ancient inheritance, Augustine made his first task at Cassiciacum the articulation of a method that he applies in many of his works in the years leading up to the Confessiones, where the diction of the auctores becomes a means of dramatizing fallenness and redemption as two sides of the same coin. Joseph Pucci is an Associate Professor of Classics, with appointments also in the Program in Medieval Studies and the Department of Comparative Literature at Brown University. He holds an undergraduate degree from John Carroll University and a doctorate from the University of Chicago. His main interests are in late antiquity, later and medieval Latin, and reception studies. He prepared the second edition of K.P. Harrington's Medieval Latin (1997) and is the author of The Full-Knowing Reader: Allusion and the Power of the Reader in the Western Literary Tradition (1998) as well as Poems to Friends (2010), a translation and commentary on the personal poetry of Venantius Fortunatus. He is also the author of a forthcoming companion volume to Augustine's Virgilian Retreat entitled Recuperating Virgil: Reading the Auctores in Augustine's “Confessions”, and is currently working on a translation, with commentary, of Alcuin's poems and letters. To order this book, please print and fill out the convenient PDF order form. Detailed information about ordering, including sales territories and methods of payment, is available on our ordering page.